Originally made of silk, measuring 6ft 6ins long by 6ft deep and carried on a pike 9ft 10 ins long. The original intent of the Colours was as a rallying point for the troops to help them locate their own regiment in the confusion of battle. The ritual of trooping the colour was originated to ensure that all knew what they looked like. 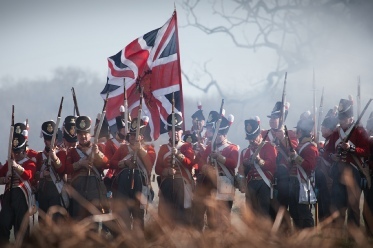 Today, even in re-enactment terms, these are the Regiment’s most treasured possessions and can never be taken from us either in battle or on any other occasion. We are all charged with the responsibility of ensuring their security at all times. 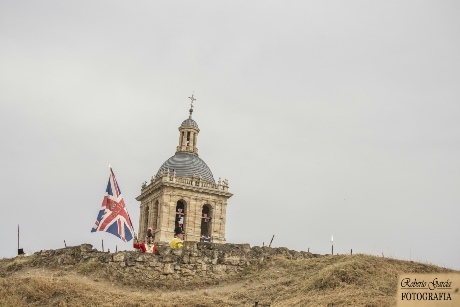 The 44th Kings Colour over the Citadel in Ciudad Rogrigo. 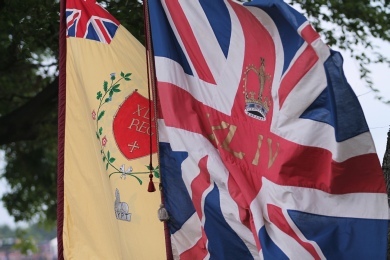 The two colours, Known collectively as a “Stand” – the Kings Colour which is the union flag with the regimental crest in the centre and the Regimental Colour made of our facing colour with the union flag in the upper right canton along with the regimental emblem and honours, in our case Egypt In 1806. The system had only just commenced and therefore by this time that was the only recognised honour bestowed on the Battalion. protection of the Regiment’s colours. They were passed on amongst the subalterns by reverse seniority as death, wounds or tiredness overcame their original bearers.